Last week I honoured one of my favourite young adult authors, Cassandra Clare. You can read that post HERE. Today I’m sticking with the young adult theme and reliving a fan girl moment! Sarah J.Maas was born on the 5th March 1986. She is a New York native but now lives in Pennsylvania with her husband. She graduated college in 2008 with a degree in creative writing and a minor in religious studies. Sarah began writing her debut novel, Throne of Glass, when she was sixteen years old. Originally, she uploaded the story to FictionPress.com (an automated fan fiction site) but later took it down when she wanted to publish. She started approaching agents in 2008 and was picked up a year later. Bloomsbury purchased Throne of Glass in March 2010, signing Sarah for two additional books in the series. The Throne of Glass franchise has since exploded, with four books (a fifth due in 2017) in the series and a possible TV show. Sarah J.Maas is now a New York Times and USA Today bestselling fantasy author. The inspiration behind Throne of Glass is one every little girl will know well – Celaena Sardothien, brutal assassin, is based on Cinderella. When I met Sarah during her UK tour last year, she entertained the crowd with her initial thoughts on plot development. What if Cinderella wasn’t a servant, but an assassin, and what if she didn’t attend the ball to meet the prince, but to kill him? Her fans certainly love the idea! Alongside the bestselling Throne of Glass series, Sarah also released A Court of Thorns and Roses which came out in 2015, with the sequel, A Court of Mist and Fury hitting bookshops in 2016. This series is based on the classic Beauty and the Beast tale. At the end of last year, it was publicised that A Court of Thorns and Roses is to be made into a film. The faerie meandered on ahead, leaping nimbly up the grand marble staircase that led to the giant oak doors in one mighty, fluid movement. The doors swung wide open for him on silent hinges, and he prowled inside. I’m sure we’ve all felt that excitement when a favourite author releases a new book, or when you read a compelling interview where they divulge their deepest secrets. It’s what we, as fans, long for – that connection to someone you admire. In 2015, I jumped on a train with my daughter in tow and headed for Birmingham for a ‘meet the author’ event organised by Waterstones. We queued down New Street in the late afternoon sunshine, sharing our reader experiences with those around us. I wondered if I would be the oldest in the room but as we all filed into the bookshop, I spotted an impressive mix of ages, from young children right up to ladies and gents in their seventies. Young adult fiction isn’t just for the young! 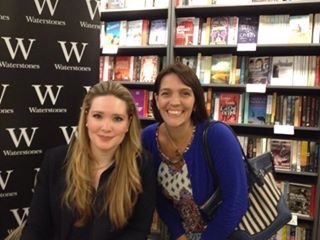 For two hours, Sarah J.Maas chatted to the room about her writing journey, the inspiration behind her books and how she came up with her characters. She answered all of our questions and then took her time to meet us all individually as we lined up for a signed copy of her latest release. She was funny, smart and inspirational and I continue to be motivated by this young woman who brings the young adult fantasy genre to life. wow thats SO cool. No I haven’t ever met my fave authors. Would love to though. What an amazing opportunity. And LUCKY you. I really enjoyed the Throne of Glass series, and think meeting Sarah Maas would be fun. Great post! Wonderful, Shelley. I feel your excitement!